NEW YORK (CNNMoney) -- For Netflix, the hits keep on coming -- the bad kind. The latest thwack: Netflix lost 800,000 U.S. subscribers in the quarter that just ended, which was littered with PR nightmares including a price hike and the Qwikster debacle. It was the first time in years that Netflix's U.S. customer base shrank instead of grew. Netflix spoke bluntly about the recent problems in its third-quarter earnings letter, released late Monday. "The last few months...have been difficult for shareholders, employees, and most unfortunately, many members of Netflix," Netflix CEO Reed Hastings wrote in a letter to shareholders. "We've hurt our hard-earned reputation, and stalled our domestic growth." Netflix said it was focusing on the future, promising customers that "we are done with pricing changes." But it doesn't think the subscriber hemorrhaging is at an end. Netflix had 23.8 million total U.S. subscribers as of Sept. 30, down from 24.6 million three months earlier. Around 21.5 million customers had streaming subscriptions, and just under 14 million had DVD subscriptions, with most customers mixing the two. By the end of the ongoing quarter, which wraps up Dec. 31, Netflix expects those numbers to drop further. It forecast that it will have 20 million to 21.5 million streaming customers and up to 11.3 million DVD subscribers in the U.S.
Netflix shares plunged 27% in after-hours trading, though the company reported earnings that beat analysts' expectations. Netflix earned $62 million, or $1.16 a share, on a record $822 million in revenue. Unprofitable quarters ahead: The company also warned shareholders that it will be unprofitable in coming quarters. Netflix said earlier on Monday that it will expand its streaming video service into the United Kingdom and Ireland. In its earnings letter later in the day, Netflix said that expansion will make the company's overall business unprofitable "for a few quarters" starting at the beginning of 2012. Netflix said it will hit pause on its international expansion after its U.K. and Ireland launches "until we return to global profitability." Netflix ended the quarter with $366 million in cash on hand, down from $376 million at the end of its previous quarter. A nightmarish third quarter: Netflix's (NFLX) quarter started off badly in July, when the company angered many subscribers by saying it would begin charging separate prices for its DVDs-by-mail and streaming video plans. That amounted to a big price hike for Netflix customers, as the cheapest-possible bill for customers who want both services jumped from $10 to $16 a month. Enraged customers flooded Netflix's site with tens of thousands of comments, as well as a barrage of tweets under the hashtag #DearNetflix. Netflix had a wave of cancellations in July as it announced its raised rates, and a second wave throughout September and October as the price hikes took effect, Hastings said Monday in a conference call with analysts. He acknowledged the consumer backlash in his letter to shareholders, writing: "We compounded the problem with our lack of explanation about the rising cost of the expansion of streaming content ... [so] many perceived us as greedy." One analyst predicts that Netflix's streaming content licensing costs will rise from $180 million in 2010 to a whopping $1.98 billion in 2012. "Our primary issue is many of our long-term members felt shocked by the pricing changes, and more of them have expressed that by canceling Netflix than we expected," Netflix wrote. As a result of the price hike anger, on September 15 Netflix was forced to cut its U.S. third-quarter subscriber estimates by 1 million customers, or about 4%, to 24 million. Shares plunged 19% that day. But the real debacle came just three days later, on September 18. Netflix CEO Hastings announced that the company's movies-by-mail service would be rebranded as Qwikster, while the Netflix brand would be dedicated to streaming video. Still smarting from the price hike, customers were incensed. They raged against the idea of managing two separate accounts -- so much so that Netflix pulled a stunning reversal a few short weeks later and canceled the Qwikster plan. "Consumers value the simplicity Netflix has always offered and we respect that," Hastings said on October 10. "There is a difference between moving quickly -- which Netflix has done very well for years -- and moving too fast, which is what we did in this case." Many pundits and customers were shocked by the flip-flop, which led some to wonder about the company's long-term vision. 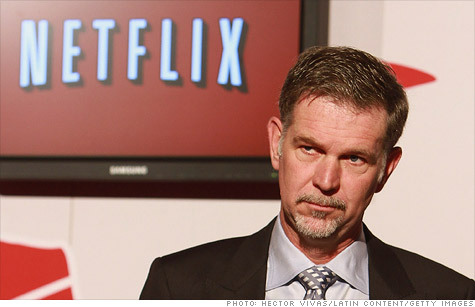 And so Netflix has begun its fiscal fourth quarter under a dark cloud. In his call with analysts, Hastings said Qwikster was a product of "Netflix not listening." He predicted the next few years will bring "a slow decline" for Netflix's DVD business. Streaming catalog woes: Netflix is struggling to build and maintain a robust streaming catalog. In September, pay-cable network Starz ended contract renewal negotiations with Netflix and announced it will pull its movies and TV shows from Netflix early next year, yanking away one of Netflix's key sources of relatively recent movies. Studios are demanding more money for their valuable content, and now they have a bargaining chip in the form of Netflix's competitors. Beyond direct rivals like Hulu and kiosk service Redbox (owned by Coinstar (CSTR)), big tech players like Amazon (AMZN, Fortune 500) and Google (GOOG, Fortune 500) are jumping into the streaming game. On the conference call, Hastings said the growing number of rival services hasn't affected Netflix's bottom line. "Relative to paid television, it's not a zero-sum game," he said. Netflix will continue to pursue contracts that give it exclusive streaming rights for content, Hastings said, adding that the overall industry is skewing that way.